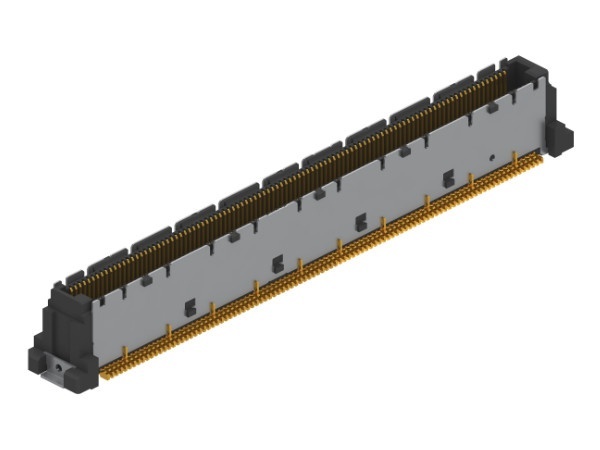 ept’s Colibri® connector is a 2-row x 0.5mm, shielded, two piece, robust and flexible SMT stacking interconnect system designed for parallel board to board stacking applications and is now available in 10 Gbps and 16 Gbps versions. Both the plugs and receptacles of the Colibri range are available for pin counts of 40, 80, 120, 160, 200, and 220. They are designed to meet requirements according to specifications not only of PICMG COM Express®, but also of SFF-SIG Core Express® X86, PCIx Gen 3, 10G Ethernet (10G Base-KR), USB 3.1 Gen2, PCI Express 4.0 and nanoETXexpress. The plug connector has a ground shield for use on carrier boards and the receptacle connector for use on COM modules has ground pins. Completely new is a 440-pin version, in which two 220-pin Colibri ® connectors are held together by a mounting frame. The mounting frame guarantees an exact positioning of the two components to COM Express specifications, arranged according to PICMG® COM.0 and will be removed after soldering. Tape-and-reel packaging, is perfect for fully automated assembly. In response to customer demand, these high-speed connectors are now also available as a Heavy Au version for deployment in challenging environments. A contact coating of 0.76 µm gold ensures reliable contacting and excellent signal integrity even under challenging conditions such as shocks, vibration, and other environmental stresses. Thanks to the thicker gold layer, the operating temperature range is extended to -40°C to +125°C. The contact design, which is optimized for high data transfer rates, means that the Heavy Au version of the Colibri connector achieves data rates up to 16 Gbps and beyond, all the while maintaining great signal integrity. In order to guarantee outstanding signal quality at these high data transfer rates, ept optimized the contact design for the entire Colibri connector series. Colibri® products are compatible with other popular connector systems on the market like Tyco and FoxConn. This has been proven by signal integrity tests carried out by the Fraunhofer Institute. The testers compared Colibri® connectors to other COM Express connectors and also tested the two connector types in combination, achieving excellent results in each scenario. A 16 Gbit/s independent test report is available on request. Surface Mount Technology (SMT) connector designed to meet requirements of PICMG COM Express, SFF-SIG CoreExpress and nanoETXexpress. 10 or 16 Gbit/s data transfer rate. Designed to be directly soldered onto printed circuit boards, Solderability tests on ept Colibri Com express connectors are available on request. ept Colibri connectors are intermateable with available connectors in the market from TE (Free Height range) and Foxconn BTB 0.5mm pitch. This is evidenced by signal integrity testing at the Fraunhofer Institute where Colibri ® connectors achieved excellent results both in comparison and in combination with other COM Express connectors. Click here for independent intermateability report. A Computer On Module (COM) form factor, is a highly integrated and compact PC that can be used in a design application much like an integrated circuit component. Each COM Express Module integrates core CPU and memory functionality, the common I/O of a PC/AT, USB, audio, graphics (PEG), and Ethernet. All I/O signals are mapped to two high density, low profile connectors on the bottom side of the module. Colibri can be seen on boards manufactured by Kontron and congatec AG; leading German suppliers of industrial computer modules using the standard form factors COM Express. CoreExpress, an advanced Computer On Module (COM) specification, was developed to accommodate modern processors like the Intel® Atom™. However, it is not bound to Intel processors. Its tiny size and low power requirements make it the ideal base for small, battery-powered, and wearable embedded PC devices.